Time for a review with a difference. 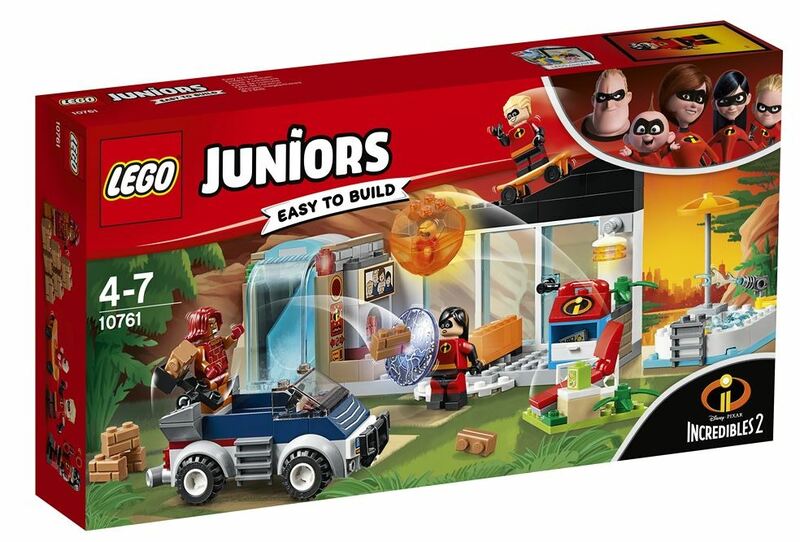 A few weeks ago I received an email from LEGO asking if I could do an early review of the three new LEGO Juniors sets based around the new Incredibles 2 movie, set to be released on June 15. The first movie, released in 2004 was fantastic, and revolved around the superhero Parr family – Bob (Mr Incredible), Helen (Elastigirl) and the three kids Violet, Dash and Jack Jack. Well, the new movie brings the family back, as well as some other returning characters like Frozone, Edna Mode and the Underminer, along with a new bad guy, Screenslaver. I’m really looking forward to seeing the film, and was ecstatic when I was offered the early access sets! The three sets are listed below, and are all now available for purchase from the LEGO Shop Online and other retailers, but I’ll be diving into them in detail and checking them out. I’m going to combine them into the one review, so I’ll be jumping around between the sets, but they’ll still get individual scores. I’ve also had some help reviewing them! 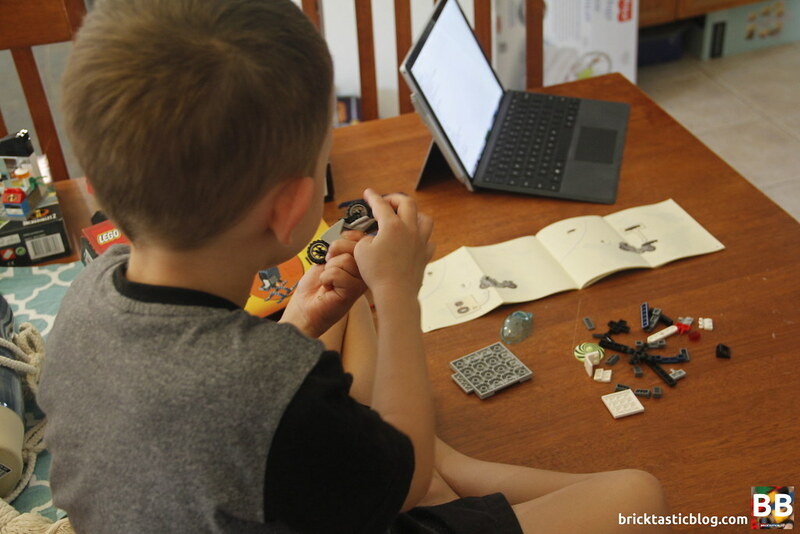 I invited a friend’s 5 year old son to build them for me, and got some insights into what they’re like for the actual target market, instead of a 30-something year old. 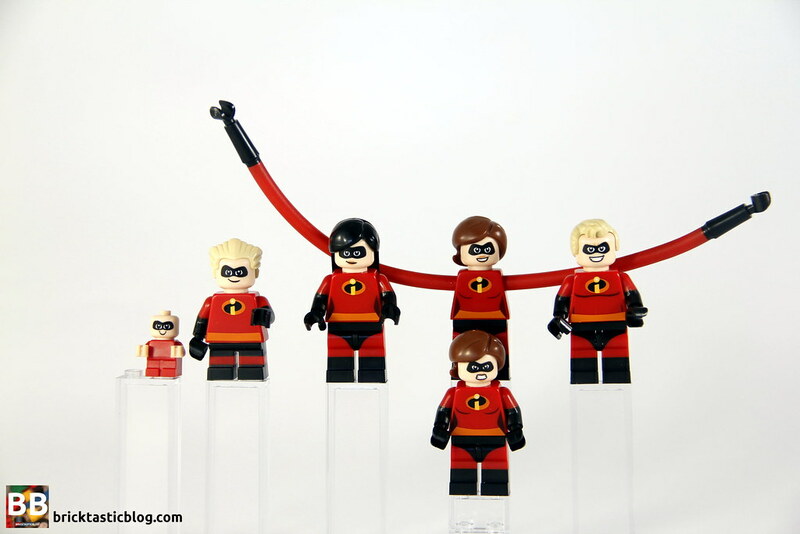 If you manage to pick up all three Incredibles 2 sets, you’ll be able to score minifigures of the entire family, as well as Elastigirl with stretched arms, as well as some other characters! You can go without 10759 and still get the whole family though, you just won’t have stretchy Elastigirl. All of the family members include dual moulded arms and legs, and double sided heads. This set contains the stretched arm version of Elastigirl, plus the main villain, Screenslaver. This is the one and only set that these two are seen. 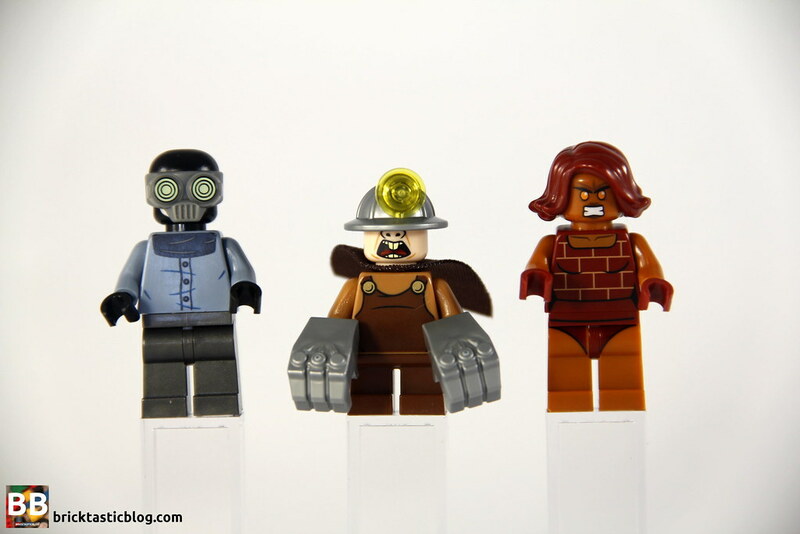 Sure, Elastigirl is seen in another set, but with standard minifigure arms. The printing is great, and shows off the characters well. This is also only the second time a stretched arm minifigure has been seen in LEGO. 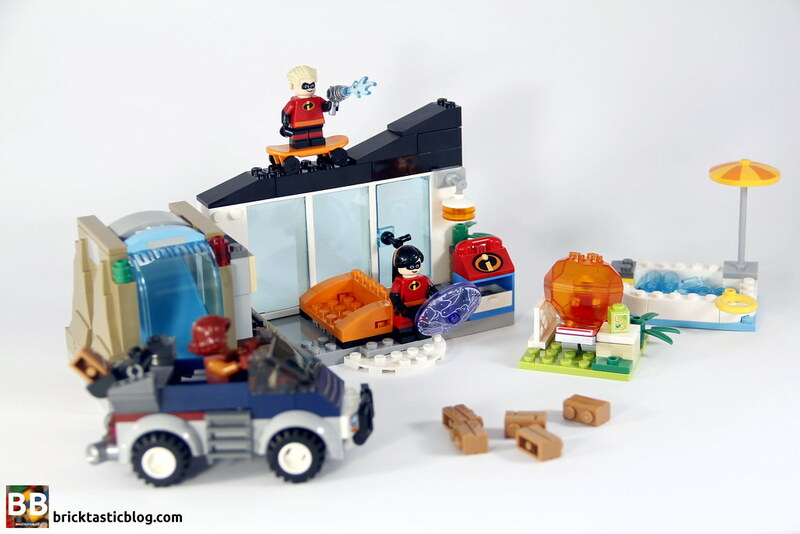 The first was Ms Marvel in 76076 Captain America Jet Pursuit from last year. Screenslaver looks particularly mean in this set, and also hypnotic with the large eyes. 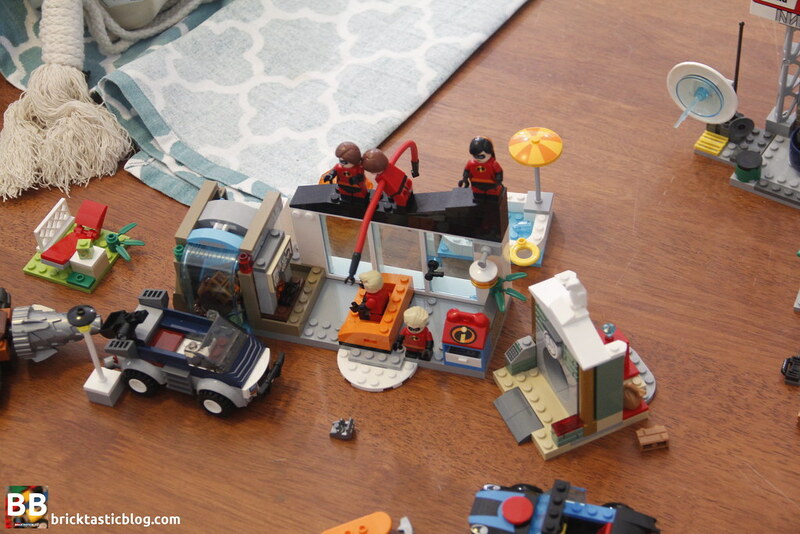 The parts include some rare items, including Elastigirl’s hair, the motorcycle fairing new in light grey, and the hypnotic printed dish and trans blue dish, among other good inclusions. The helicopter piece is a new one in dark blue, although it has been seen before in Juniors sets in other colours. I also like the sign for Elastigirl’s approval rating – a nice clue to the plot of the film. Mr 5’s favourite part in this set was the laptop – “Oooh! A little computer!”. 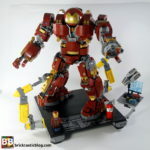 This was the last set we built, and he was fading, but he did have fun looking through the parts. 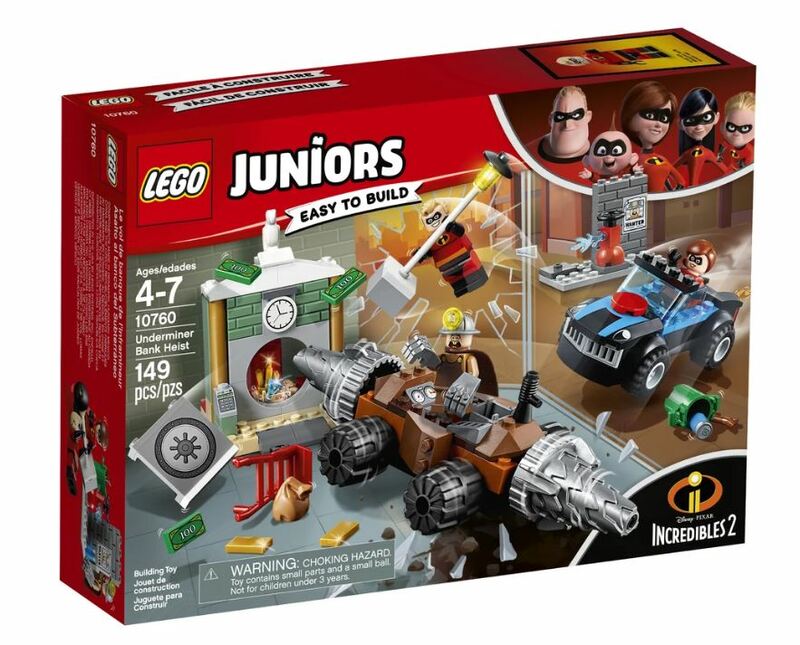 Underminer Bank Heist has Underminer, Mr Incredible and Elastigirl included. Again, these are beautifully printed, and great inclusions in a Juniors set. It’s great to see a return of Mr Incredible’s hair from the Disney CMF series back in 2016, as well as a new torso, legs and head. The main difference between the two is the orange belt was on the hips in 2016, and now it’s on the torso. There’s also some difference in the shading on the torso, and the composition of the face. There’s also a parrot, new in white, and some conical drills, as well as a stack of other awesome inclusions, and printed parts. Underminer’s cape is also quite unique, and was picked up on by a very perceptive Mr 5 – “there’s only one hole for the neck, it’s a lot easier”. His eyes are covered by his helmet, but it’s in line with the movie version. This set had a few surprises for me! The minifigures include Violet, Dash and Jack Jack, the first (ridiculously adorable) baby with a printed head, a red body, and flesh coloured hands and head. There’s also another character, Brick. Now, by the looks of the cover art, Brick is a villain. Mr 5 also lined up all the ‘baddies’ with Brick amongst them. She’s pelting bricks at the kids, and Jack Jack is in full rage mode, but according to The Disney Wiki, Brick is a heroine! I’m guessing all will be revealed in the movie, but it was a strange inclusion in a set. It’s great as well though, as the minifigure is fantastic. The brick printing on her top is great, and she’s got a very scary expression on the reverse side of her head. Of all four minifigures, Violet is my favourite one. Her hair in particular is excellent – a new element. She’s also got a purple printed dish to represent her shield powers. Dash comes with a skateboard and shorter legs, and a water pistol. 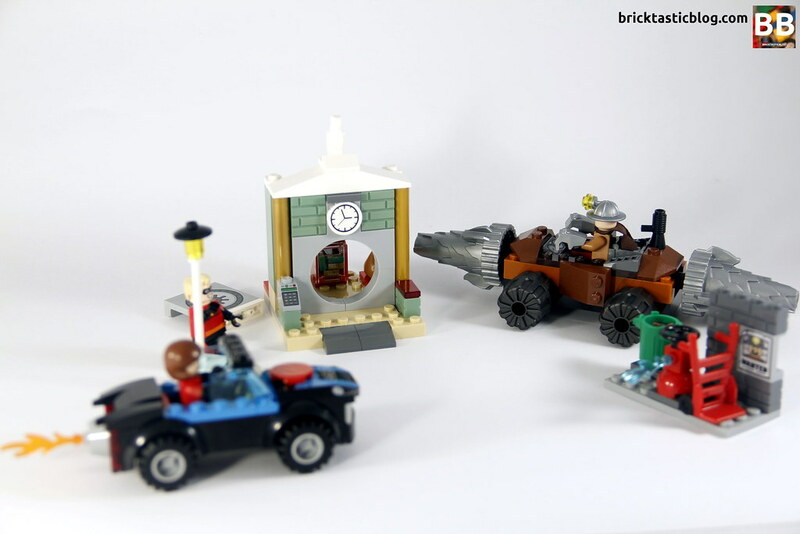 There are plenty of other great elements in the set – the red 1×3 printed sloped brick, the printed orange dish used as an umbrella, the large white wall with three window holes, and more. Mr 5 particularly liked the little juice box, and we both loved the slide! It’s the first one for me. It’s appeared in Friends sets in this colour, and exists in two other colours as well. I also really like the bullbar. They’re in a number of City sets these days, but I’ve not picked any up, so this is the first time seeing one. They look fantastic. All of the builds are simple and easy to follow. Mr 5 had no problem in following the instructions carefully and piecing the sets together. I’d say of all the sets though, the trickiest part was making sure the masonry bricks were the right way around. Aside from that, it was incredible (yep, I said it) to watch him get stuck in. So focused and patient, and happily chatting away to himself and me. We started with the biggest set, 10761. The first thing Mr 5 said to me was “there’s no stickers!”. I was instantly impressed with this comment! 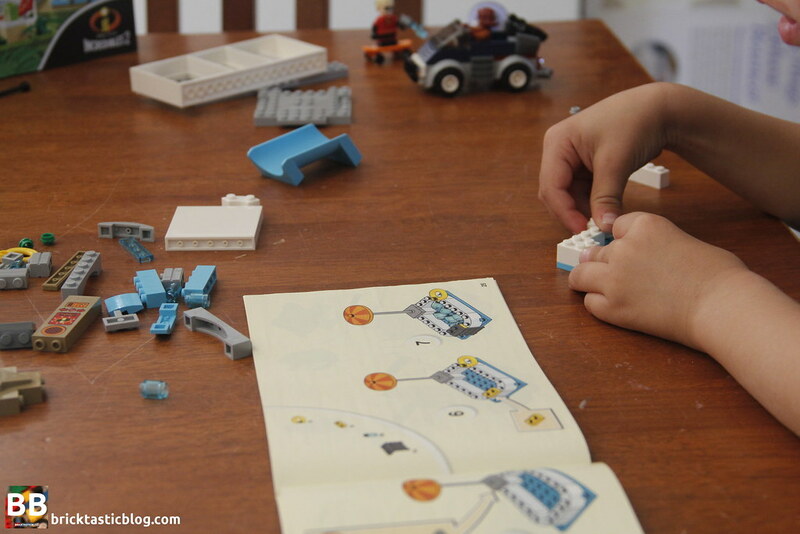 The build process starts with Violet, and Brick’s vehicle. It’s an easy build, especially with a big car body. Then comes the waterfall and hidden slide, followed by the pool, lounge chair and house. The waterfall section gets added on. Mr 5 exclaimed with glee “Oh! It’s a secret panel!”. This was a fun feature and incredibly easy to build – the fireplace section just sits loose in the slot. Even for the fiddly bits like the door and hanging light, it wasn’t a problem. This one starts with Mr Incredible and his lamp post, followed by Underminer’s double drilled vehicle. It’s elegant in it’s simplicity. Next is Elastigirl’s car, again another very simple build, followed by the building sections – the vault and the extra wall. Mr 5 loved adding the drills to the vehicle, which quickly resulted in lots of spinning them around! Lastly was the smaller set, 10759. The little bloke had faded pretty quickly by this point, asking if I could help, but then swiftly taking over control once he saw some of the parts! 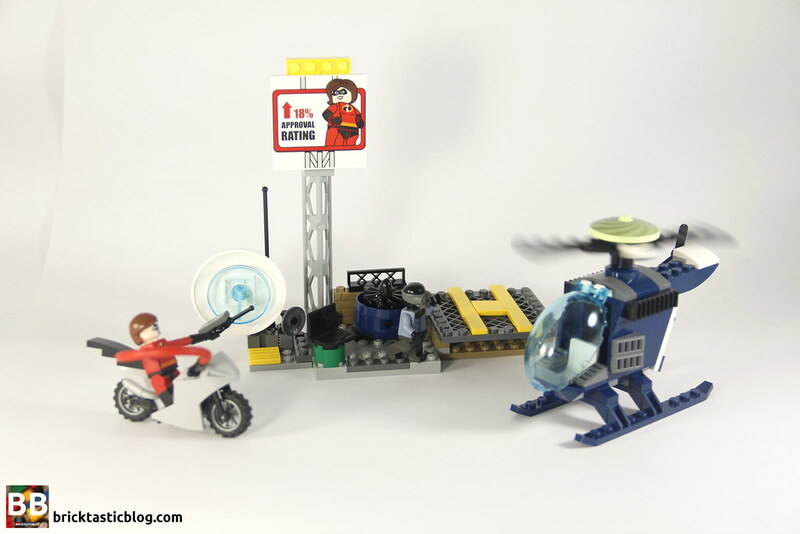 The bike and the helicopter are done first, allowing Elastigirl’s long and bendy arms to be put to the test, followed by the building. This was one I enjoyed watching getting pieced together. Some of the details are cleverly executed. So, the scores! These are based on the joint thoughts of Mr 5 and I. These sets are all inherently playable. It’s the first thing Mr 5 wanted to do after finishing them all – “Mr John! Let’s play!”. Combining them all meant a lot of fun blending the characters, but I also noticed him playing with them in isolation. It was also a lot of fun for me! The biggest play drawcards though? The slide in 10761 and Elastigirl’s bendy arms from 10759. I was honestly pretty surprised by this. I thought the cars would be the first to get driven around, and they did, but not to the extent that the slide and Elastigirl were used. Using the drill to knock down the door is awesome. A critique from me would have to be that in 10761, I would have liked to have seen something clipping the sliding panel in from the top. Purely for a strength point of view, but the current way does make it easier to play with for littler hands. For play purposes though, these sets are a lot of fun. 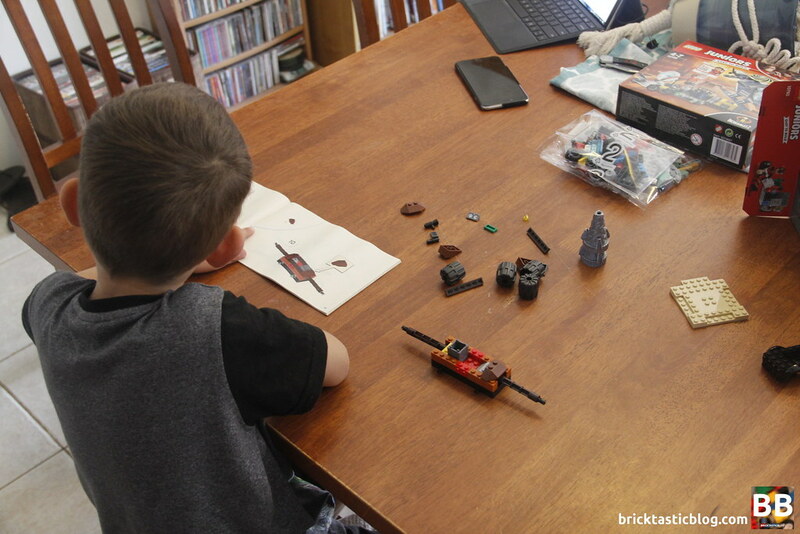 We spent ages playing with them all – the vehicles are great, the buildings foster imagination, and the minifigures are detailed and mean that new stories can be created from these characters. If, after watching the film, they don’t like how it played out, they can change it with the LEGO sets! 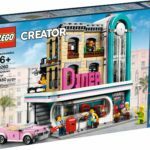 I understand what LEGO is trying to do, and I completely understand that these are Juniors sets, so the level of realism tends to be sacrificed for simplicity in the build process. There are areas of these sets that are fantastic, and others, through the eyes of an adult, that could do with some work, but that’s not what I’m picking up on here. It’s about realism and design through the eyes of a child, the target audience of these sets. Kids have an incredible imagination, and I managed to get a bit of an idea after chatting with Mr 5. I’m also assuming that the Incredibles 2 sets would be played with after watching the Incredibles 2 movie, so the idea would be driven home then as well. This set is meant to be at the top of a building. It’s a clever representation of it, especially with the helipad, billboard tower and exhaust fan. How the motorbike gets up there is anyone’s guess (I suppose the movie will let us know), and the helicopter is great for a Juniors set – easy to build, with a little bit of SNOT work thrown in for good measure. Mr 5 didn’t understand the top of the building concept, but it was still fun nonetheless. Through the eyes of an adult, I would have added a little more snot work to the edges of the building, to give the impression that we were on a roof, but the little details are there. It just means that for some, there might need to be a bit of an explanation about the setting. We loved this one. The vault looked perfect, and the way the door pops off after getting hit with the drill is excellent. We weren’t sure about the extra outside build, with the fire hydrant and the bin, but Mr 5 loved them. “Look! It’s the baddie on the wall!”. The white at the top of the vault is nicely done, and the colours work really well together. This was a really good one. The house and all of the other builds in this one are fantastic! Easily the best one of the lot, design and appearance-wise. From the sliding wall to the couch, the pool and lounge chair, the vehicle and of course that excellent slide, it’s all brilliantly executed. I’m really looking forward to seeing the movie, as I want to see how these look in the film version. To be honest, the true value for money in these sets lies with the minifigures. They are fantastic. There’s not too much detail, but having the whole family included is a big bonus, as well as a stretched arm version of Elastigirl. I’m very happy! The remainder of the parts are somewhat single use only, but I’m sure there are clever fans out there that will do something amazing with them. 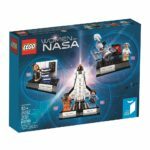 For AU $40 and $50, these sets are on the pricey side, especially as they’re marketed to younger fans, so that’s a bit of a hit for this category. I can see families getting one set, but forking out $130 on all three might be a bit of a stretch. If you can do it though, it’s worth it for the whole family of minifigures. If you or your kids are fans of Disney and Pixar, and especially of the original movie, then the Incredibles 2 sets are great to collect. Obviously you’ll want to get the whole lot for the full family. 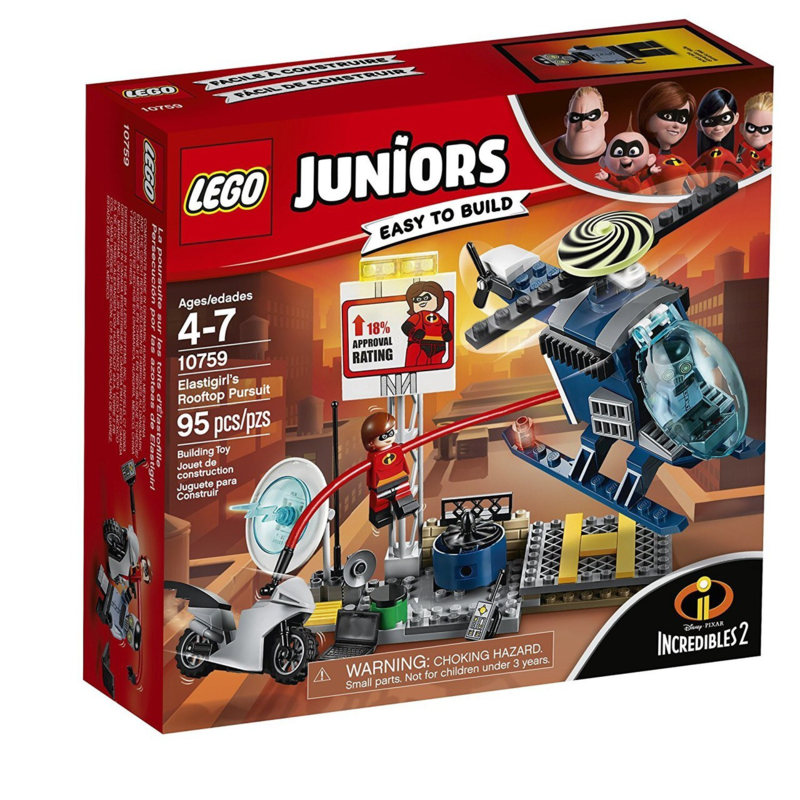 There aren’t many other sets that fit the Incredibles brand, aside from the two minifigures from the Disney CMF series, Mr Incredible and Syndrome, the US and UK had a polybag version of Edna Mode, and there’s the BrickHeadz set 41613 Mr Incredible & Frozone. That’s it. They’re immensely collectible, however the Edna Mode polybag is definitely harder to get, especially for those of us outside of the UK and US. If you’re willing to fork out the $130 for three Juniors sets, then you’re in for a treat. 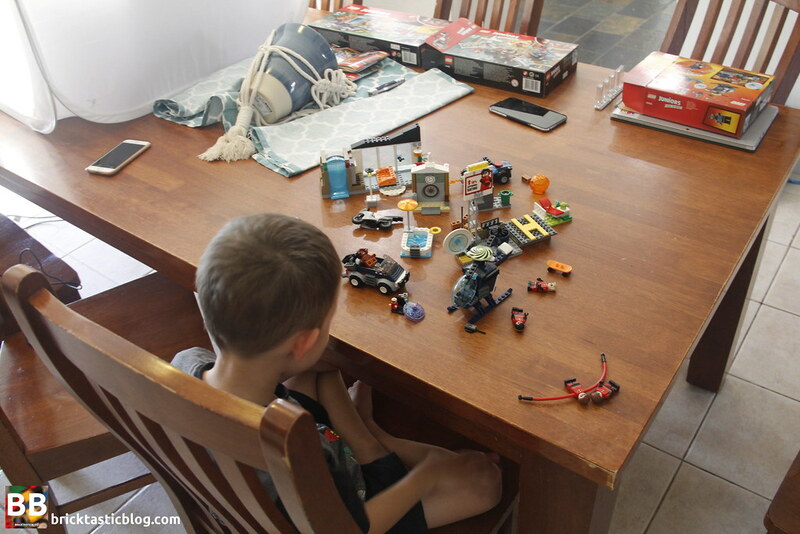 Thanks very much to Mr 5 for helping me out with reviewing the Incredibles 2 sets. It was a heap of fun, and you were an absolute star! A special thank you to LEGO for sending me early access copies of the three sets for review. All thoughts on this set are my own (and Mr 5’s in this case) and are not influenced in any way, shape or form. The provision of sets for review does not guarantee a favourable review.